You are currently browsing the tag archive for the ‘water bath canning’ tag. Things are going well I think. I only wish the proper direction would reveal itself. I have been researching ways to raise money to start a physical Ellipsis as well as the best and least expensive ways to create sustainable ways of operating a business. Here in Galena there are possibilities of renting a store front. The biggest obstacle is how to grow enough Camelia to make enough tea. The answer I think, is to build a geodesic dome. It’s a pretty amazing concept. Essentially a greenhouse, it is a dome built from triangles. The idea of them is that they are entirely self-sustaining, meaning everything from the heating to the water flow is all created within once introduced. And since they are built of wood and polycarbonate panels with UV glazing, it can withstand very severe weather conditions. All this; however, is a very big undertaking and would require either the use of or purchase of property. Where as if the move to California happens I could grow a whole field of Camelia right in the open. I am fascinated with the idea of building a structure that could grow fresh food all year round. It would be like creating a paradise with the perfect temperature all year round. A little oasis. According to growing spaces, a company out of Colorado that manufactures geodesic dome kits, a dome that is 22 feet in diameter can produce food for 4 to 5 people all year round. Imagine if every community had a large geodesic dome to grow food. Our food would be entirely in our hands. Anyroad, I made some delicious black raspberry jam yesterday. I did not use pectin and it turned out lovely. A little softer than typical jam, but delicious none the less. And also a batch of radish relish. I love how pink it is. 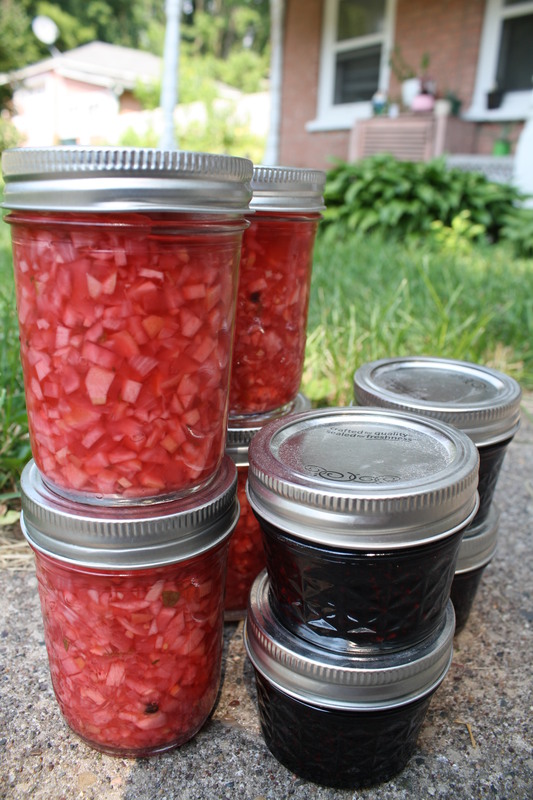 The radish mix and watermelon radishes I planted really made for a pretty relish. It’s good on crackers or a sandwich like regular relish. I will share the recipe for the relish with you. Put the radishes, celery and onion through the coarse blade of a grinder, or chop them finely. Mix with remaining ingredients and allow to stand three hours. Bring to a boil in a large pan and cook ten minutes. Pour into hot jars, leaving half-inch head space. Adjust lids and process 1/2 pints and pints in a boiling water bath for 20 minutes. 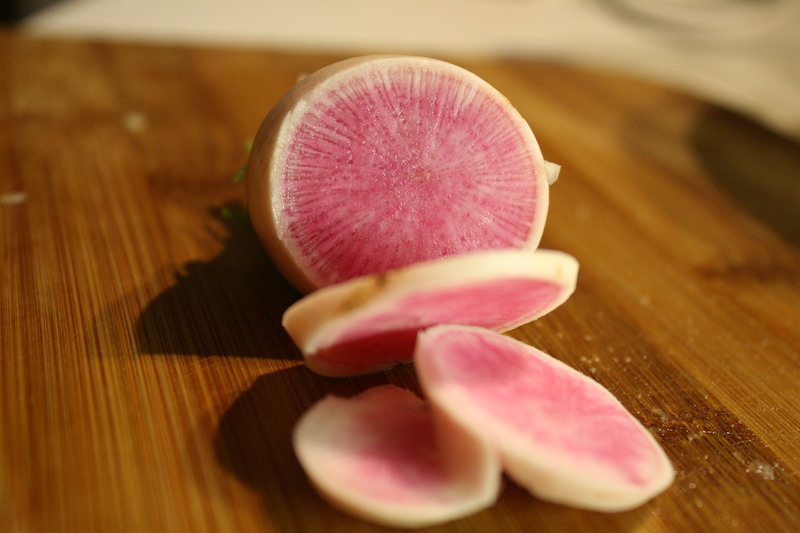 The watermelon radishes are so pretty. I have to thank Rachel for these seeds. Ellipsis really is getting closer and closer to full conception all the time. Wouldn’t you love to sit in a cozy used book store sipping a cup of locally grown artisan tea, eating a scone with some homemade black raspberry jam? And to top it off, the business is as sustainable as it feasibly can be at that given moment and it is working to make your community a better place to live and work. This is something I must make happen, wherever the future takes Ellipsis Books and More.